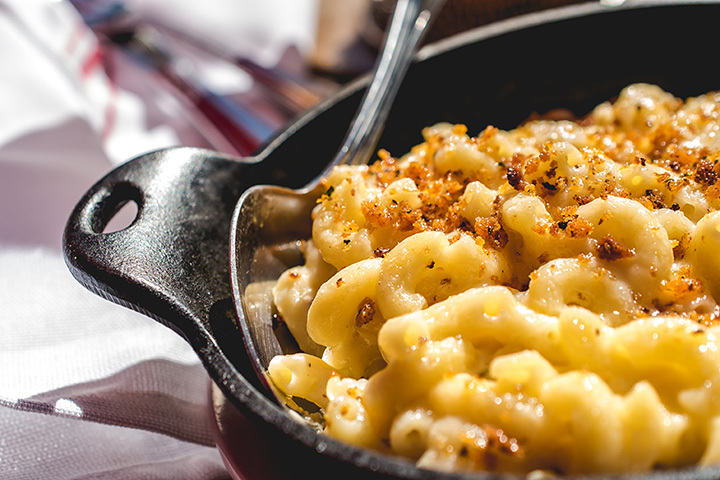 The 10 Best Places for Mac and Cheese in Arizona! Mac and cheese isn’t just for the kids anymore. Nowadays, mac and cheese dominates local menus. Chefs have redefined the dish by adding their own blend of unique flavors to an American favorite. Local chefs are no exception. Here are 10 places to relive your youth with some seriously tasty mac and cheese. Arizona’s mac and cheese headquarters can be found at the Fix in Tucson. The Fix is all about comfort food. They have nearly 40 different mac and cheese combinations available on their menu. You can find spicy mac and cheese like the Buffalo chicken or jalapeno popper. Or maybe go for a pizza like offering like the Hawaiian or meat lovers. Then again, there’s no denying the classics like the all American or double bacon. The Fix has upped the ante for other restaurants with their mix of delicious cheese and home made recipes. Soul food is an underrated food category. Who doesn’t like chowing down on fried chicken with some collared greens? Mrs. White’s Golden Rule Café has the finest soul food Phoenix has to offer. This downtown establishment is a haven for foodies looking to forget about calories and enjoy some culinary pleasures. No trip to Mrs. White’s Golden Rule café is complete without their signature mac and cheese. The four-cheese creation is a decadent side that pairs well with their renowned fried chicken. Bobby Q’s is known for its tender barbecue. But it’s their mac and cheese that takes this restaurant to the next level. You wouldn’t expect a side dish to draw in customers. But Bobby Q’s mac and cheese is that good. The homemade mac and cheese is rich, creamy, and comes out piping hot. Bobby Q’s is comfort food at its finest. The mac and cheese may be a side, but it’s so delicious you just might have to snag a second order. You might recognize the Duce. That’s because it’s been featured on “Diners, Drive-ins, and Dives” and even made the list of Food Network’s best mac and cheese on the road. This is one of the rare cases where the restaurant lives up to the hype. Set in a converted speakeasy, the Duce is known for its signature cocktails and inventive menu items. It’s also known for its decadent mac and cheese. The Duce has an interesting twist on the classic recipe. They sell mac and cheese muffins that are too good to adequately describe. 47 Scott is one of Tucson’s classier establishments. They may specialize in modern American fare, but don’t sleep on the old classics. They have some of the best mac and cheese in Tucson. Their mac and cheese is served with a healthy portion of house Mornay cheese sauce and sourdough breadcrumbs. You can also add in special toppings like mushrooms, bacon, and sautéed vegetables for the ultimate experience. Roaring Fork knows a thing or two about cooking. Their wood-fired cooking technique brings forth many bold flavors on their modern American menu. The cooking definitely benefits the green chile mac and cheese. The spicy creation brings forth bold flavors and is not for the faint of heart. This Southwestern take on an old classic brings some serious heat to an already tasty dish. BrushFire BBQ is a barbecue lovers dream. They only have two sizes—regular and hungry. It’s the ultimate barbecue spot filled with good sauces, tender meats, and good beer. It’s also known for a hearty creation known as the messy mac and cheese. It’s a pile of mac and cheese, French fries or Fritos, and topped with your choice of meat, barbecue sauce, cheese and pork belly bits. Start prepping your stomach. Mac and cheese may be a starter, but it’s certainly filling. At least that’s the case in Phoenix’s Tuck Shop. Tuck Shop is known for a wide-ranging menu with influences from Asia, Europe, and Australia. But they also make really good American food. The Times Mac and Cheese is made with rich macaroni and gooey cheese. It also comes with house cured bacon and herbed breadcrumbs. If you’re really looking to go all out, you can also add lobster for a seafood twist. Lux Central is one part coffee shop, one part hipster hangout, and one part mac and cheese maestro. This uptown Phoenix hot spot is known for top-notch food, but their mac and cheese is on another level. The gooey, creamy plate comes with an extra punch. You can even add bacon and jalapenos to fully indulge. You just might fall in love. Rehab Burger Therapy is all about the burgers. This Scottsdale burger joint has some of the most creative burger concoctions in the Valley. Case in point: the spicy mac-n-cheese burger. This ode to gluttony is topped with pepper jack cheese, poblano pepper, jalapenos, green chili, Siracha and bacon. Oh, and also a pool of mac and cheese. The decadent mac and cheese is also available as a stand-alone item. You can order either in the rehab or relapse size. Regardless of preference, there are no empty stomachs after a trip to Rehab.